LOWER EAST SIDE — A beloved Astoria pizzeria is taking over a slice of the Lower East Side. 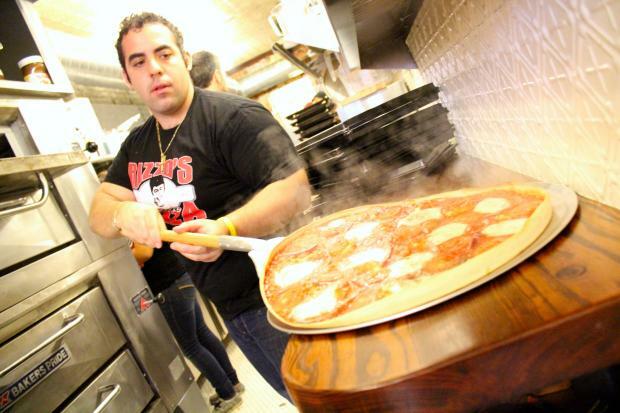 Rizzo's Fine Pizza, a family-owned business with a history stretching back more than 50 years, recently opened a slice shop and neighboring 30-seat restaurant at 17 Clinton St., between Stanton and Houston streets. While the pizza recipe will stay true to the eatery's signature thin crusts and square slices, the new Rizzo's will add fine wines and craft beers to the menu. "The Lower East Side has been a target of ours for years," said Philip Rosello, the store's manager, who has been working for Rizzo's for 15 years. The late Joseph Rizzo, an Italian immigrant, opened the first Rizzo's on Steinway Street in Queens more than five decades ago, with customers lining up for his pizza squares with few toppings. His son, David Rizzo, now runs the business, which also has a location on Lexington Avenue at East 94th Street. The shop only began serving round pizzas with a wider variety of toppings in the 1990s, after getting requests from customers, Rosello said. "Before that, people were lining up for a square piece of pizza with a square piece of cheese," he said. Now Rizzo's offers a range of specialty pies such as the Golosa, with chicken, bacon, mushrooms and onions, and the Mafiosa, with sausage, roasted peppers, olives and capers. The Lower East Side location pays homage to Rizzo's heritage not just with recipes, but also with its decor. Artfully hung on the walls are tools such as a cheese grater, a rolling pin and a pizza cutter. "These are some of the original wares from the original Rizzo's," Rosello said.